I’m not quite sure how to describe this book. It’s not a “how to” guide and it’s not a personal journal. It is lots and lots of wisecracking commentary on specific photographic lighting situations, and frankly, its a lot better book than I thought it was when I first started reading it. I’ve never been much of an artificial light photographer. That’s partly because I’ve always preferred the look of “natural” light. But I’d have to admit that it’s also because I’ve never really mastered artificial lighting. I started shooting when everything was film and when you had to use guide numbers to guesstimate your exposure – which I was never very good at.You shot, bracketed, shot, bracketed, shot again and then prayed something would show up on your negative. Of course, if you were shooting action, you also prayed you’d remembered to change the shutter speed to 1/60th or you knew you were totally screwed. I don’t think I ever owned a decent flash. And even when a I used one of the newspaper’s flash units it always seemed like something or other would go wrong. Most common being dead batteries or a pc cord that didn’t work. Anybody who was active in the 70s knows what I mean. The old cords that were supposed to connect to the camera and fire the flash were notoriously fragile. A bad cord meant no flash, which was embarrassing and frustrating. One more reason to rely on natural light whenever possible. So, I’ve got real admiration for McNally, who embraces artificial light and makes it work for him. But, as I read the book, I also began to appreciate how much the technology has changed and realized that even I could learn to work today’s incredibly talented flash units. I’ve got to admit, that of all of the new advancements in equipment these days, I probably find the advancements in strobes the most amazing and wonderful. Coupled with the instant feedback of digital cameras, it’s pretty incredible to be able to set up a simple flash shot, see the results immediately and adjust accordingly. But, I’ve digressed too much. Back to McNally. The beauty of this book is that through McNally’s commentary you actually learn a lot about shooting with artificial light without getting bogged down in formalistic lessons. If I have a complaint about the book, it is that McNally’s technical sections are a little too Nikon-centric for me. It’s what he uses and what he knows, so I can understand that. Still, as a Canon user myself, I’d have appreciated a little more generic information. But, frankly, that’s quibbling and kind of misses the point. With a little experimentation, his lessons can be applied to any equipment. In fact, McNally’s central lesson is to first help you actually “see” the light and then to learn how to start to control that light. He doesn’t offer step-by-step instructions, which is a good thing. He’s primarily interested in location shooting and the unique characteristics of each location makes detailed 1,2,3 instructions kind of pointless. Instead, he offers tips and advice based on his years of experience. Little lessons that you can apply to your own situation and help you start to learn. 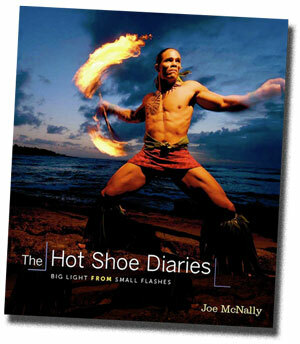 This entry was posted in Books, Photography Instruction and tagged Flash Photography, Hot Shoes, Joe McNally, Lighting, Pictures Sharp Life Not so Much, Strobes. Bookmark the permalink.